I bought these on sale awhile back, but they were just sitting in my freezer because usually when I have a craving for a burger, I don’t want it to taste like pizza. That’s a pizza craving – very different. And answered with a pita, some sauce, and daiya toasted under the broiler for a few minutes… mmm. 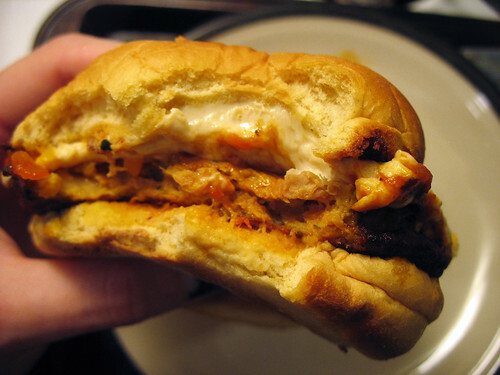 But eventually I had to try the “pizza burger”. I figured since it was already pizza-flavored, I’d top it with tomato sauce and daiya mozzarella… under the broiler for a few minutes to toast the bun and melt the daiya. Looks pretty delicious! And it wasn’t bad. I mean, you really can’t go wrong when you had sauce and gooey melty daiya. 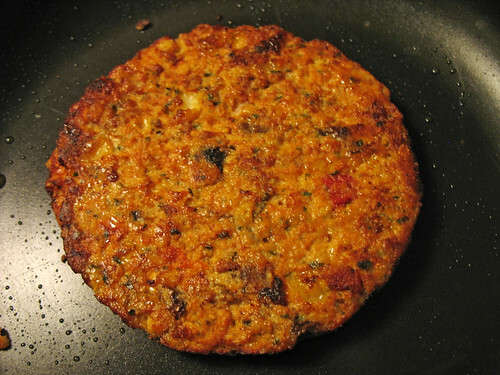 The burger patty itself was definitely strongly flavored with basil and oregano, the usual pizza flavorings. I don’t know if I would have really enjoyed it without the sauce and daiya though – on its own, or with more traditional burger toppings like lettuce and tomato, it just wouldn’t be that great. 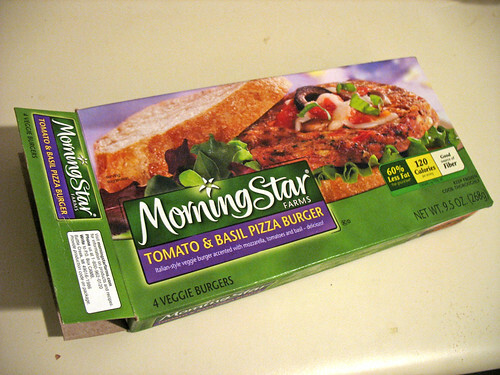 And I was disappointed to realize that this was another one of those MorningStar products that is not vegan – actually, the box advertises that it has mozzarella and provolone inside the patty (I didn’t look at it too carefully). 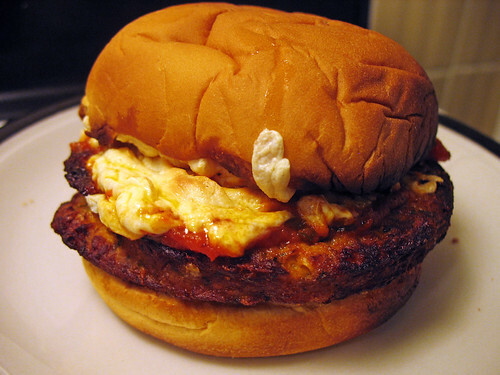 Since I can only eat a limited amount of dairy, I thought I was doing a good job by topping it with daiya – but I hadn’t counted on cheese being inside the patty! I don’t think I’ll buy these burgers again – both because the taste wasn’t so amazing and because of the cheese. But there may be more pizza burgers in my future… those toppings were pretty delicious. I’ll just put them on a different patty next time. I used to LOVE these burgers when I was in highschool, but now in my mid 20's, the fake pizza flavor is way too harsh. Hey, if you're ever in Las Vegas, try the vegan burger at Holsteins in the Cosmopolitan, I just stayed there and it was seriously amazing, like one of the best veggie burgers I've ever had. These aren't totally vegan. This brand and this flavor has traces of milk and eggs in it. Therefore not being vegan friendly, but lacto-ovo vegetarian friendly. Anonymous, I actually mentioned in my review that these are not vegan. If you had read the entire review, you surely would have noticed that. I am a vegetarian, and while many of the burgers that I review ARE vegan, many others are only vegetarian. I try to make sure I point out the difference on each review for the convenience of my vegan readers, as I have done on this review.